Connect your Zope/Plone installation to all ODBC compliant databases and data sources in a hassle-free, robust and scalable way - with our easy to use mxODBC Zope Database Adapter™ for Zope and Plone. Our new version mxODBC Zope DA 2.1 was specifically engineered to make it easy to install the adapter in the Plone 4.x series. It fully integrates into the zc.buildout installation system used by these Plone versions and supports Python versions 2.6 and 2.7. 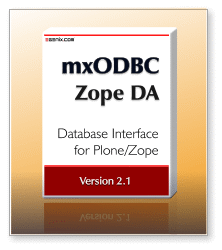 If you need database access for older Zope/Plone releases, please consider using version 2.0 or version 1.0 of our mxODBC Zope DA product. These support Zope versions as old as Zope 2.3.
mxODBC Zope DA 2.1 is made available as egg archives that can be installed via the zc.buildout installation system used by Zope 2.12 and 2.13. You can use the same installation instructions as for Plone to get the Zope DA installed. Full 64-bit Support: The underlying mxODBC 3.2 library fully supports 64-bit platforms such as Windows Server 2008, Mac OS X 10.6 (Snow Leopard) and 64-bit Linux systems. Compatible with Plone 4.0, 4.1 and 4.2: The zc.buildout compatible installation process allows easy integration with your existing Plone 4.0 - 4.2 installations. Compatible with all major ODBC managers: mxODBC 3.2 supports the Windows ODBC manager, the Mac OS X ODBC manager and the three most popular ODBC managers on Linux: unixODBC, iODBC and DataDirect. If you are intending to upgrade from an existing mxODBC Zope DA license to the new mxODBC Zope DA 2.1, please contact the eGenix.com Sales Team with your existing license serials for details for an upgrade discount coupon. We will give out 20% discount coupons for upgrade purchases going from mxODBC Zope DA 1.x to 2.1 and 50% coupons for upgrades from mxODBC Zope 2.x to 2.1. After upgrade, use of the original license from which you upgraded is no longer permitted. Please note: The Plone installers ship with Python 2.6, so you only need the Python 2.7 builds in case you have a manually installed Plone/Zope version. These egg archives include the mxODBC Zope DA Zope Product and all necessary eGenix.com mx Products (including mxODBC 3.2) prebuilt for Zope/Plone installations in one binary archive. Please note: The Plone installers only ship with 32-bit versions of Zope which won't work with these egg archives. You only need these downloads in case you have a true 64-bit build of Plone/Zope. You will need to have one of popular ODBC managers for Unix installed on the target system: iODBC 3.52.x or unixODBC 2.3.x. We have successfully tested the Zope DA with iODBC 3.52.7 and unixODBC 2.3.1.